Checkers is a board game played by two persons who alternate moves. The losing player is the one who has lost all his pieces or cannot move anymore because all of his Checker pieces have been blocked. Standard checker pieces are flat and round. In every Checker game, the starting position of the Checker pieces never varies, with the pieces positioned only on black squares. The Checkerboard consists of eight horizontal rows and eight vertical columns with 64 squares of alternating dark and light color. The initial position of the pieces is the same for both players (12 on each side), with a white square found for each player on the first row and at the far right, as for chess. 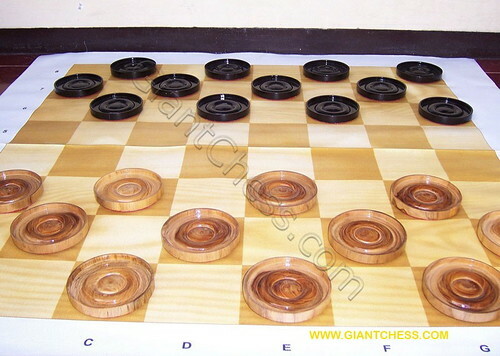 We provide checker pieces that made from best Teak wood include also its board. It also suitable for outdoor checker game for whom like to play it at garden or backyard. In the picture above we put the checker pieces on the fabric board, which is very easy and light to carry anywhere.